To what extent can videogames be held responsible for human deaths? What are the implications of paying vulnerable populations, such as the homeless, to create Internet material? What does it mean for chatroom users to communicate with a nonhuman entity, such as Burkebot — a language-recognition program that uses a stock of Kenneth Burke quotations? These are some of the questions investigated in the five chapters of Jeff Pruchnic’s book, Rhetoric and Ethics in the Cybernetic Age: The Transhuman Condition. The first two chapters introduce his tasks at hand: one, Pruchnic delineates the historical separation between Platonic philosophy and sophistic rhetoric to aid in his larger goal of bringing logos and techne together to rethink contemporary issues of technology and communication; two, he advocates for transhumanism as the best philosophical framework for achieving the former. Pruchnic relies heavily on Julian Huxley’s definition of transhumanism, which claims that understanding and replicating the processes of the natural world would “lead to a much greater cross-coupling of, or growing indiscernibility between, the natural and the artificial as conceptual categories” (10). The last three chapters utilize and expand Huxley’s definition of transhumanism in particular “cases” of what he suggests as indicative of the contemporary moment we are in. These final three chapters, which utilize theories of Burke, Deleuze, and Nietzsche, among many others, move toward rhetorical ecology as an approach for rethinking current ethical dilemmas of technology and communication, particularly as the human body is implicated in cybernetic loops that inform power distribution and knowledge production. In short, Pruchnic’s overarching claim of the book contends that new technology does not entail dehumanization and homogenization, as critiques of our contemporary moment claim; instead, current technology and communicative modes confirm an intensification of the human in processes of politics, economy, and culture. 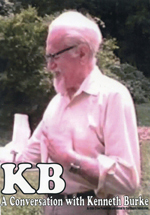 Because this review is for the KB Journal, it seems appropriate that I focus on the ways Pruchnic directly engages with Kenneth Burke. Interestingly, the only direct link to Burke is about halfway through the book in the third chapter (the first of his “cases”): “Rhetoric in the Age of Intelligent Machines: Burke on Affect and Persuasion After Cybernetics” (100–19), wherein Pruchnic draws on Burke’s earlier works Counter-Statement and Permanence and Change. Although this is ostensibly the only chapter “about Burke,” Pruchnic’s book appears to fold into itself, making it possible to review it through the lens of Burke. In other words, the ways Pruchnic engages with Burke could be read as the ways Burke folds into the overarching topics of the book — rhetoric, ethics, cybernetics, and transhumanism (if one is to take the title literally) — and vice versa. Folding is, as Pruchnic points out, a common trope in Burke’s work. So, to think about Burke’s earliest writings on rhetoric and aesthetics folding into the book fits Pruchnic’s goal “to thematize persuasion ‘after cybernetics’ — the ways in which computing technologies and new media have changed the bases of public persuasion” (102). This is a somewhat difficult task to accomplish with Burke considering the fact that Burke was opposed to “the becoming-machine of humans (and vice versa)” (Pruchnic 100) as well as the early cybernetic movement emerging contemporaneously with Burke’s career. However, Pruchnic makes it clear that his attempt to engage Burke with cybernetics is twofold. One, Pruchnic wants readers to rethink Burke’s earliest writings not as undeveloped thoughts on their way to becoming more mature works later on. Instead, Pruchnic sets out to convince readers that Counter-Statement and Permanence and Change are the criticalfoundations for how Burke will continuously investigate many of his recurring topics of human perception and response, or the ways Burke establishes “the crucial site of persuasion . . . neither as the unconscious or false consciousness, but the corporeal” (106). Two, and as a result of one, Pruchnic wants readers to rethink cybernetics, particularly early cybernetics, also as embodied. Challenging claims that cybernetics’ primary “impulse” is “toward disembodiment and the creation of artificial intelligence,” Pruchnic contends that the movement “might aid in transforming human perception and response,” much like Burke’s own sites of inquiry (105). The thread holding these two goals together for Pruchnic is affect, particularly the role of affect in human perception and response. Burke views affect as one of the determining characteristics of humans as opposed to animals or machines. It is the affective capacities between human bodies that ensure and propagate persuasion as human. While some readings of cybernetics would pit embodiment and artificial intelligence against each other (as noted above), Pruchnic claims that human affect is central to new technology and media’s greater influence in political, economic, and cultural persuasion. Or, human affect becomes indiscernible from artificial processes of communication. Transhumanism, then, brings humanism into question as a pervasive ethical framework and becomes a conduit for rethinking current issues. In other words, the techniques of the human not only enhances but is also enhanced by contemporary technology and communication. In the first chapter, “The Transhuman Condition,” Pruchnic lays out two shifts in contemporary culture that he sees as defining, of course, the transhuman condition. One is the conception of modernity as associated with constant transition, yet putting the body at stake like never before. The body is used in new ways, which “extends” cultural change “beyond social or experiential factors into more explicitly material and biological realms” (21). For Pruchnic, the rhetorical and ethical implications of this extension is most notable in something like neuromarketing, which he discusses later in the first chapter. Imaging technology, such as functional magnetic resonance imaging (fRMI) and Electroencephalography (EEG), allows one to see how marketing techniques work beneath the cognitive level, making it easier to target audiences. This brings the embodied — the neurological and biological happenings — to bear on how new technology impacts communication, which is a move away from simply intellectual modes of persuasion. With this in mind, though, readers must remember the second shift that Pruchnic situates as characteristic of the transhuman condition: while contemporary technological and material processes have changed capitalist production, science, politics, and marketing — via microtargeting, to be specific — it has become easier for institutions of social power to take advantage of these new “targets and resources” (22). Pruchnic makes sure to point out the ethical dangers of this expansion and redistribution, but he encourages readers to see this as ultimately positive. For example, microtargeting possible through contemporary techniques and media creates new networks that become simultaneously more specific, more explicitly collaborative, and more embodied. In chapter two, “The Age of the World Program: The Convergence of Technics and Media,” he challenges Heidegger’s critiques of technology, most notably that “technology produces . . . an ‘unconditional uniformity’ of humankind” (66) and the “essence” of technology as a “compensatory mechanism” to fill a metaphysical void (63). To dispel these Heideggerian myths throughout chapter two, Pruchnic rethinks the Turing Test “not as an epistemological endeavor but as a rhetorical ecology” (84). This means that Pruchnic reads the Turing Test not as a task of determining what is human and what is machine, but rather as a process by which both human and machine engage and perform in complex ways. Or, new modes of persuasion emerge through the capacities of both human and machine to confront assumptions and values previously held as common knowledge. One way to sum up rhetoric’s investment in that process is Pruchnic’s emphasis on rhetoric as concerned with “a spectrum of directly motivational or persuasive forces” rather than “representation, epistemology, or ideology” (17). Pruchnic’s engagement with Burke becomes apparent through Burke’s concept of Metabiology, an ecological approach to understanding “human actions and thought processes as networked” (Pruchnic 112). Burke is always concerned more with the pragmatic rather than the epistemic. This is most noticeable in his “scope and reduction” strategy (e.g., Four Master Tropes or Five Elements of Dramatism) (Pruchnic 104), as well as his inquiries into how effects are produced and what they do, rather than what effects are or what they should be. At its core, Burke’s Metabiology is such a pragmatic endeavor, as well as a rhetorical ecology. Moreover, Pruchnic makes direct connections between Burke’s Metabiology and cybernetics, particularly through theorizations of feedback, equilibrium, and homeostasis. The interdependence of the human and the material creates phenomena that can no longer be separated by qualitative distinctions, but rather emerge through dynamic processes of cooperation and communication (112). So, while Heidegger’s critique of technology would argue that “our connections to ‘reality’ and each other are increasingly mediated through impersonal and informatic exchanges of various types” (Pruchnic 63), Pruchnic suggests that Burke’s concept of Metabiology opens up new (ecological) ways to rethink affect and agency through phenomena produced through human and machine together. Rather than a convergence (or separation) of distinct entities, Burke’s Metabiology emphasizes an emergence of body and environment. Pruchnic contends this aspect allows room for rethinking the rhetorical strategies that might be most helpful in intervening in the contemporary forces of social control. In the fourth chapter, “Any Number Can Play: Burroughs, Deleuze, and the Limits of Control,” Pruchnic focuses on the matter of intervention, particularly as he does not envision interventions of contemporary culture as radical reorganizations or total inversions. Instead, as he points out in chapter one, he wants to “figure out how these same techniques already immensely immanent” in contemporary power structures can be reworked and improved to better understand issues of inequality and control (38). In a sense, he wants to unfold and refold current techniques of power and control. In chapter four, then, Pruchnic introduces doxa as a useful term in this folding. He points to doxa (“opinion” or “common belief”) as an unaccounted for concept in the making and remaking of knowledge. As a contrast to episteme (“true knowledge”), he argues that doxa is often left out as a contributing factor in contemporary power and control. In other words, doxa emerges in much the same way as episteme, but is somehow dismissed as passive. For Pruchnic, taking any knowledge for granted, especially common opinion, puts theory’s relevance at stake. Rather than relying on critique, or relying on a concept of returning to some previous state of naturalness, theory should come to terms with its own persuasiveness as a result of taking both doxa and episteme for granted. To do so means “not a resistance to or renunciation of the forces in which one is immersed” (142), but a rethinking of how complacency within current systems of power and technology can be redirected in new ethical frameworks. The fifth and final chapter of the book, “On the Genealogy of Morals; or, Commodifying Ethics,” deals more directly with the question of ethics, particularly as they are defined in Platonic, rather than sophistic terms. This final chapter, then, attempts to bring logos and techne together at last. He “take[s] up a technological and rhetorical ecology” that “might offer productive strategies for responding to the ethical and political challenges of the present moment” (147), which he suggests are useful for the refolding he proposes in chapter four. Again, the distinction between Platonic philosophy and sophistic rhetoric comes into play; Pruchnic highlights the transhuman body not as separated from but as simultaneously informed by and informing current technological modes of communication. The techniques of contemporary culture in the face of new technology provide affordances for rethinking the ethical implications of distinguishing between “truth” and “persuasion.” Ethics, as they are inextricably linked to our rhetorical modes of persuasion (and thus technologically), are then the commonplaces for contemporary culture, as well as the toolbox by which conventional knowledge emerges and circulates. Although Pruchnic’s book theorizes the ways rhetoric can be useful in rethinking ethics in our current moment of technology and communication, he never fully articulates how this can be done. This might suggest, then, that the work of redirecting and improving the networks in which we operate is still thetask at hand. 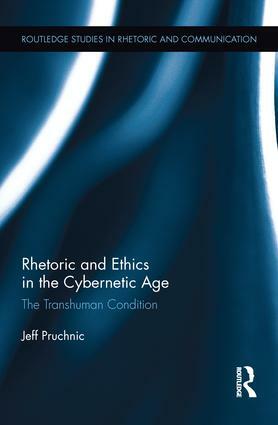 With that in mind, Pruchnic’s book reads less as a method for intervening in issues (and uses) of technology today and more like the historical account that will help us — primarily rhetorical scholars — understand how deep dualistic traditions have done us a great disservice and, moving forward, aid in our reimagining of human and machine in productive cybernetic loops.